LOS ANGELES (CNN) –President Obama is tapping his California ATM with a combination of star studded concerts and intimate high dollar dinners. 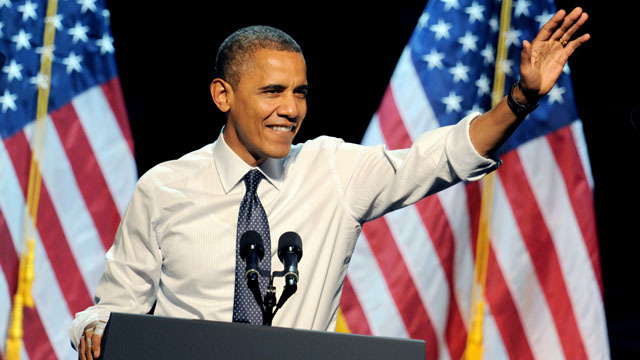 He’s expected to raise nearly $9.5 million dollars for the Obama Victory Fund over two days. The West Coast swing kicks off with a big concert at the Nokia Theatre in Los Angeles, featuring musical acts Jennifer Hudson, Stevie Wonder, Katy Perry, Jon Bon Jovi, and Earth Wind and Fire. Actor George Clooney is slatted to deliver remarks. A campaign official tells CNN an estimated six thousand people are expected at the Sunday evening event with tickets starting at $250. Mr. Obama will also meet privately with a dozen so called high dollar donors along with former president Bill Clinton, and attend a dinner with 150 guests at $20,000 per person. On Monday, the president heads to San Francisco where he’ll attend three fundraisers. **A $40,000 per person event at the intercontinental Hotel. **A $20,000 per ticket dinner at the Bill Graham Civic Auditorium. **And another concert featuring John Legend and Michael Franti that’s expected to draw about six thousand people, with tickets starting at $200. In a separate event at a private residence on Monday in Los Angeles, President Clinton is expected to raise an additional $160 thousand. Campaign officials say this big fundraising push will help them compete in key battleground states where polls still show a tight race. What a snake. he had 2 new questions added to the unemp. Are yiou working part time? STOP YOUR LIES. PART-TIME WORK IS ALWAYS ACCOUNTED FOR IN THE SURVEY, AS ARE THE SELF-EMPLOYED AND FARM WORKERS. U-6, the longtime underemployment and unemployment number, remained fixed at a dismal 14.7%. Why when Obambam cheats does he get a pass??"? Romney kicks his A$$ in debate on economy = job #s mysteriously Rise??? YOU DON'T SEEM TO BE GETTING SOMETHING VERY FUNDAMENTAL HERE. THESE STATISTICIANS WILL NOT LIE FOR ANYONE, THEY HAVE BEEN THERE SINCE NIXON! TO ASSUME THAT SOMEHOW OBAMA CAN MANIPULATE THEM IS PATENTLY ABSURD! THOSE CLAIMS YOU MADE? I ALREADY TOLD YOU THEY ARE FACTORED INTO THE SURVEY EVERY MONTH! YOU ARE PLAIN LOONEY TUNES OR SENILE LIKE JACK WELCH. DOES ANY OF HIS B.S. SOUND FAMALIAR??? HE WOULD HAVE HAD TO ADD OGVER 800,000 JOBS FOR # TO DROP, AND THAT DIDNT HAPPEN, DID IT?? SO JUST LIKE JACK WELCH, YOU ARE ACCUSING PEOPLE WITHOUT ANY PROOF BECAUSE YOU WISH IT? YEAH, YOU ARE BATSH*T CRAZY. HOW ABOUT YOU STUDY WHERE THESE NUMBERS COMES FROM? IT IS ALL THERE ON THEIR WEBSITE. THESE STATISTICAL JUMPS AND DROPS HAPPEN OFTEN WHICH IS WHY THESE NUMBERS ARE SOMETIMES ADJUSTED IN A PERIOD OF 2 OR 3 MONTHS. THESE MONTHLY STATISTICS ARE NOT PERFECT BUT TO ASSUME THEY ARE BEING MANIPULATED IS NOT ONLY STUPID BUT SIMPLY IRRESPONSIBLE. SO JUST LIKE JACK WELCH, YOU ARE ACCUSING PEOPLE WITHOUT ANY PROOF BECAUSE YOU WISH IT? YEAH, YOU ARE JUST PLAIN CRAZY. HOW ABOUT YOU STUDY WHERE THESE NUMBERS COMES FROM? IT IS ALL THERE ON THEIR WEBSITE. THESE STATISTICAL JUMPS AND DROPS HAPPEN OFTEN WHICH IS WHY THESE NUMBERS ARE SOMETIMES ADJUSTED IN A PERIOD OF 2 OR 3 MONTHS. THESE MONTHLY STATISTICS ARE NOT PERFECT BUT TO ASSUME THEY ARE BEING MANIPULATED IS NOT ONLY MORONIC BUT SIMPLY IRRESPONSIBLE. HERE IS A PRETTY GOOD CRITIQUE OF THIS NON-ISSUE. go to that site you left and look up questions aked last time and this time. Throbbing Member 2012 – the "Home Employment Sector" added over 800,000 jobs – so about 1 in 4 "small businesses" were created last month. Also, the same sector hadn't reported an added job for almost 20 months prior to these 800,000 jobs. "The idea that the numbers were consciously manipulated is, quite simply, absurd and it betrays the kind of conspiracy theory mindset best left to the people who think that there are aliens being kept at Area 51 and that Elvis and JFK are running a diner in Montana. The fact that it’s being pushed by people like Jack Welch, the former CEO of one of America’s most prestigious corporations, is all the more troubling. Say what you will about Welch, but he’s no Donald Trump, and I’m not sure whether or not he simply tweeted something without thinking (believe me, it happens) or whether he actually believes that the Obama campaign is manipulating economic data. On the other hand, I’m not at all surprised to see people like Allen West pushing this theory, his time in Congress to date has not exactly been auspicious on a number of counts and he seems to attract most of his support from the most radical wings of the Tea Party movement." "I think. Much like polls are merely a snapshot in time and any individual poll can be subject to any number of variables that could turn a reliable poll in to an outlier, the twin employment surveys can be flawed for one reason or another in particular months.This is one of the reasons that the BLS routinely revises it’s figures for at least two months after making the initial report. So, to some extent, we shouldn’t put too much import on a single month’s report, especially if it is inconsistent with other, more reliable, economic statistics." "The idea that the numbers were consciously manipulated is, quite simply, absurd and it betrays the kind of conspiracy theory mindset best left to the people who think that there are aliens being kept at Area 51 and that Elvis and JFK are running a diner in Montana." NOBODY IS ARGUING THIS MONTH REPORT COULD BE FLAWED AND REQUIRES FURTHER REVISING FOLLOWING THE SAME PROCEDURES THEY HAVE BEEN USING ALL THIS TIME. HOWEVER, YOU IMPLIED THAT SOMEHOW THEY HAVE CHANGED THINGS SOMEHOW FOR THE PRESIDENT, WITHOUT ANY PROOF. THAT'S LIKE IMPLYING THE REPUBLICANS IN PENNSYLVANIA TRIED TO PASS VOTER ID LAWS SO ROMNEY CAN WIN. OH WAIT... NO, WE CAN PROVE THAT ONE BECAUSE WE HAVE IT ON TAPE. Throbbing Member – I said nothing about numbers being manulipulated – I simply told you where the number actually came from. From that it appears you assumed the number is being manulipulated. These jobs added did not show in the normal ADP report as paychecks paid out as is usually the case. Think what you will – the rest of us who are paying attention are. Also, since when do we go back several months to recalculate these numbers? July was revised from 141,000 to 181,000 and August was revised from 96,000 to 142,000. December is correct. The unemployment numbers for September have been calculated based on the same method as before. In other words, based on the method of analysis, they are accurate. However, I just read an interesting article on Business Insider that describes how the numbers are determined. It includes participation rate in the calculation. Their conclusion. "Whereas the headline unemployment rate has dropped from 8.5 percent to 7.8 percent this year, if there were the same number of people looking for work today, as there were in December 2011, the unemployment rate would have only dropped from 8.5 percent to 8.35 percent today." JOHN, COULD YOU FOR ONCE NOT THINK THIS IS ABOUT YOU OR WHAT YOU'RE SAYING BUT WHAT IS ACTUALLY BEING CLAIMED BY THE THREAD STARTER? THAT IS ALL I AM TRYING TO SAY. Fundamentally if anyone is going to manipulate the jobs numbers it would be the person whose office controlls the BLS...HELLO! and that person is John Boehnor. This from the Daily Beast. "Finally, look at the revisions. Just last week, the BLS released a preliminary revision to a year’s worth of jobs data showing that the employment level was actually 386,000 higher than they previously estimated. I imagine the campaign team in Chicago would rather have had that 386,000 spread out over 12 months of jobs reports. The BLS also always goes back and revises the monthly reports. The best example is August 2011. The initial report said the economy had added zero jobs. That number was revised up 57,000, and then with a second revision, the final number was 104,000 jobs created. But did that change the initial headlines about job growth foundering or the mistake the widespread impression that the economic recovery had skidded out? The answer to that question is the same as the answer to whether the Labor Department is cooking the books." Just an honest question Jean. Did the Daily Beast provide any information why the numbers are always revised up. Are there any months where they revise down? "The Bureau of Labor Statistics reported that July’s figures were revised down to 141,000 from 163,000, while June’s figures were revised down to 45,000 from 64,000." moneynews -"Morici :Structural Problems are Hampering Recovery"
Which is the reason the number hung at 8.1% unemploymnet for so long. Thank you for clarifying. I did miss those numbers. Repo loonies. Romney's extreme makeover and lies are not giong to cut it for the American people. Look, the Republicans left this country in an economic mess and two wars. They have given trillions in tax cuts to the super rich and now they are blaming Obama for not cleaning it up fast enough. Don't fall for it people. Obama thought he would just be given the debate victory by the media, both of which are clearly out of touch with average Americans. Romney's extreme make over and lies is not going to cut it for the American people. Even Big Bird is on the chopping block. "Obama swings west for campaign cash"
While another $3 Billion dollars is addd to your children's debt under our 4 YEAR OLD budget. Another historical first..
Why did you not complain when Bush was racking up our debt, two wars on our credit cars and trillions in tax cuts to the super wealthy? Hey, Clooney, Weinstein, Streisand, and all the other Hollywood "tycoon thugs." TAKE Obama - you can have him - put him in one or your horror movies - we don't want him - and ALL the tainted Hollywood money in the world isn't gonna re-elect him this time. Get it????? Romney/Ryan - restoring sanity and REALITY (NOT MAKE-BELIEVE) in America !!!!!!!!!!! Yes, Obama, go out west all the way to California where people are going broke because of your failed policies and empty promises and then ask them for money. Ya, that's classy. The sad thing is that they'll just vote the same idiots back into office again year after year. That state has all kinds of resources and potential to get themselves out of the hole they're in but they're too dumb and stubborn. rosco That California air would be better if the state had high-speed trains instead of endless smog filled 8 lane freeways, and if you didn't insist that your iPhone and iPad be made in China by slave labor. Besides a lot of that air pollution is caused by all that unenvironmentally friendly Chinese manufacturing, that you're in love with, crossing the Pacific to our shores. suggested reading: The New York Times- "Pollution From Chinese Coal Cast A Global Shadow"
Well they had the good sense to get rid of that pig Schwarzeneggar who with normal GOP tactics tripled their budget deficit to $16 billion. Why do you refer to Schwarzenegger as a pig? YEAH, WE ALREADY KNOW THAT YOU DON'T KNOW A WHOLE LOT. THAT'S DOESN'T SEEM TO STOP YOU FROM SPREADING BS ANYWAY. These loonies on here are paid Republican trools who are a bunch of racist, angry, old men who are paid by conservative special interest groups. Yes Lionel we are all a bunch of racist angry old white men. So much for the party of "love." Of course, you have some evidence to support your claim. Maybe you could add something constructive to the conversation for a change. THIS IS NOT EVEN ABOUT OBAMA. MAKING UNFOUNDED CLAIMS OF CORRUPTION IN THE BLS IS ABOUT DUMB AS IT GETS. IT SHOWS JUST HOW STUPID PEOPLE CAN GET TO PROMOTE THEIR PARTISAN RHETORIC. DRANK THE KOOL AID? MY GOD, YOU ARE SWIMMING IN IT! I would have to agree concerning the BLS. However, I would prefer to swim in beer. ROSCO, YOU ARE CONSPIRACY NUTCASE. THESE REVISIONS HAPPEN EVERY TIME, EVEN WHEN THERE IS NO ELECTION. WHERE WAS YOU OUTRAGE THEN? STOP BEING A DUMBAZZ. Yeah December. I may very well be swimming in beer come November 7. Hopefully you will understand if my spelling is way off that day. WELL, THAT'S THE BEAUTY OF ALCOHOL. YOU CAN DROWN IN IT NO MATTER THE MOOD. CHEERS. Romney is like the man on the horse at the circus who can change his coat from the inside to the outside without you see how he did it; or like the person running the shell game at the Midway of a County Fair. Even tho, it appeared that he won the first debate– he lost. Romney proved beyond any doubt that he is a liar on his tax plan. Romney proved that he will gut Social Security, Medicare, Obama Care and any program that benefits anyone but the rich. He gave us a perfect example: PBS and “Big Bird.” Romney proved that he is still a high school bully by breaking the rules of the debate and playing by the rules of a Bain Vulture Capitalist. Visit the Internet Free Press and see how you can help PEOPLE POWER PRICE CONTROL and Consumer Price Control bring down the price of gasoline below $3.00 per gallon. Funny, how the oil companies try to steal the election by raising the price of gas during an election. as usual your wrong cali has diff regs and will only use gas processed in thier state right now they have two plants down and on the verge of bk check it out your green state isnt so green and its run by dems, it has top cities for bk, bad air, and polluted oceans check it out i encourage it, hows the bambam crush?? $3.59 per gallon regular central Ohio today. Are you bragging? Ohio inherited from President Bush a low gas price of $1.60. What happened Jean? He demonizes the 1%'ers on one day then becomes their friend on the next, just to beg for cash. Many of these "artists" are self-absorbed people who live in high class neighborhoods yet act as if they are in touch with all Americans, the perfect crowd for Obama. They both pretend to be something they're not and get paid for it. Unlike Robme, Obama cares about ALL Americans. He does not ignore half of the country. Does he care about the workers who are going to be surprised with pink slips because Obama didn't want big business to violate the WARN Act so bad news wouldn't hamper his campaign? No? Maybe they're just collateral damage. Wow, Obama, you have some 1% in you after all, don't you? WHAT ARE YOU TALKING ABOUT? WHY WOULD ANYONE WANT BIG BUSINESS VIOLATE THE WARN ACT? YOU ARE NOT MAKING ANY SENSE. I think it rather ironic, that when our economy is at such a standstill, our so called elected, and "wannabe" elected officials, can raise millions and billions for their own personal campaigns. The rich, wealthy, and "movie stars", seem to be oblivious to the rest of us "common folk", the under-middle, and middle class. They have no worries over money, because quite frankly, they have most of it ! Are we to just sit by and watch this atroscity? While I do not agree with any policies of the Iranian Government, I find it rather disturbing for the leader of that country to stand up and say that we have no business telling them how to run, or not run their country, when we are in such a mess ourselves. Come on, you SO CALLED leaders of this great nation we call AMERICA, stop dividing us ! Didn't we fight a civil war so that ALL could be free in this country? I feel like the only true free ones, at this point, are those who are free to support our current President. If you don't, then you're some kind of radical. Consider me a radical, because I support a FREE AMERICA, not one run soley by and of the government. I believe in God the Father, God the Son, and God the Holy Ghost ! I believe God is STILL in control, and if we continue with our current President, America is in BIG, BIG trouble. You think that we've met with some harsh weather, fires, floods etc.? If we continue with where we are being taken by this President and his dishonest lackeys, be sure that we will see another four years if harsh weather patterns, and possibly a volcanic eruption or two, or three. God surely cannot be pleased with a President who made the statement, "We are NO LONGER a Christian nation". Figure the math. He who has the understanding, let him understand !!! he is swinging west alright.......illegally west into foreign countries. 8.1 % to 7.8% only took almost his entire term for a .3% difference when he promised back in 2008 to never let it go over 8% 7.8% is still really high. Obama you had your term and made things worse. As you best put it 4 years ago "Time for Change" but now that change is something besides you! I believe there is a difference between what a candidate states is their goal (not a promise) and what can actually be delivered with a two party system (not a dictatorship). But what a proposed candidate like Romney said in a closed room to contributors who are basically buying and paying for him to fulfill their wishes if elected....yep! He feels exactly that way about the 47% and meant exactly what he said. He can prattle all he wants to about caring about the 100% of the people...but as the old saying goes "its too late the horse is already out of the barn"
As an old lady of 77 who has voted in each election since old enough to vote, and who has raised two sons....I can tell you...This man has serious flaws of character that have shown themselves time and time again as not being presidential material. He just doesn't man up when caught. How many dogs do we need to have chained on the roof of a car, or a person with a military deferment who protests FOR others to fight and die instead of just thanking his lucky stars and keeping quiet, or a bully who cuts another student's hair, the man who has stated "he likes being able to fire people".REALLY! What kind of a twisted twit likes firing people? ..investing in a Chinese company that used slave labor ...to build his bottom line...unwilling to show his tax returns probably because he was one of those who took amnesty for evading American taxes...not willing to invest his money in America and keeps it in taax havens like Bermuda and the Caymens....and the flip flop after flip flop on every issue once it is found he was obviously originally on the wrong side of that issue....look at his first touting Romneycare and now disavowing Romneycare because it is not what his funding masters want...".I was for it before I was against it" anything to cover his behind. Really, this is not presidential material, this is a grown spoiled rich boy with no moral compass that wants a toy of power. You are entitled to your opinion..but that is my honest assessment of Mitt Romney. In all my years I have never seen a candidate that scared me more. As for the uemployment figures, after 30 months of employment improving from the depths ofthe country losing 750,000 to 800,000 jobs per month...the jobs market has over the last 30 months continually increased, with the rate having set for 3 months at 8.1% and each month for several months every new jobs report has had to adjust the number of employed people upward for the numbers of the previous months, it is no surprise that the number finally dipped below 8%. to 7.8%. For anyone who says the method of determining those numbers is wrong NOW shows just how uninformed they really are. Cutting another student’s hair, seriously that is an issue with you? You claim to have raised boys and I also have a son and yes young boys will do most anything when they have scissors in hand because my son also had his hair cut when he was young by another kid. If you have a 401K or other pension retirement then you can bet they most likely are invested in various Chinese or other foreign companies. We the People have the Freedom to Chose where we invest our PERSONAL money; however, Obama invested U.S. GOVERNMENT money in Chinese companies via Solyndra and other stimulus which turned around and COST U.S. CITIZENS billions of dollars in failed garbage. A person who does not mind firing people is someone who understands that if they do not do their jobs, then you fire their tail ends … which is why this November I plan to FIRE OBAMA and yes I WILL LIKE IT! He would much rather be out golfing than attend his government briefings. Sorry I do not pay him to play golf and take nice vacations costing the citizens lots of money. Romney has showed his taxes which is NOT required by our CONSTITUTION. Obama on the other hand when first elected spent a lot of money on legal fees not wanting to show his birth certificate, and it is DEFINITELY required by our CONSTITUTION that you be a U.S. Citizen for which the birth certificate is proof. There is now one posted after how many years spent fighting the issue, so why the initial fight? That just made no sense. Romney defended his insurance program and stated during the debate that he has no issue with these type medical programs as long as they are at the STATE level. It has no business being done at the Federal level. • I wanna golf and not attend those boring briefings. • I wanna go where I choose alot for vacations instead of Camp David (where proper security already provided). So what if it costs the U.S. Citizens lots more money. I’m president so tuff cookies for the people on how I spend their tax dollars. • I do not wanna tell the people that terrorists attacked our embassy in Libya so instead I’m gonna tell a tall tale about some online video. So what most did not know about the video until I made an issue of the situation and in turn made a lot more middle-eastern people angry. • I do not wanna tell the people about “Fast and Furious” and those guns ending up in the hands of drug cartels. • I do not wanna follow the Constitution and because I am President and I will enact Dream Act allowing illegal aliens to stay here. And because I am president I get to decide who and which laws must be followed in our Country. The Constitution under Section 8 states: “The Congress shall have Power To … To make all Laws which shall be necessary and proper for carrying into Execution the foregoing Powers, and all other Powers vested by this Constitution in the Government of the United States, or in any Department or Officer thereof.” I believe Obama failed to read the “any Department or Officer thereof” because that includes the presidency. • I do not wanna have Federal contractors provide WARN Act notice to employees facing sequestration following the laws. And if the contractors get sued I’m gonna tell them that the U.S. Citizens will foot the legal bills. I could go on and on; however, the main point is Romney has not violated laws and has not violated the Constitution of the United States. I for one do not plan to spend the next 4 years same as the last “do nothing” 2 years. Sorry, Obama is too arrogant with attitude of "my way or highway" and has not been willing to reach across party lines for the best interest of the people. We need someone who will reach across all Party lines and move forward with bipartisan effort. Why would Obama waste his time now? He has tons of money and the election is only a month away. good at raising money and campaigning...but a horrible president....money aint goin to save you obama. You had your chance and blew it...the obama experiment is over. Obama to potential donors, "Don't look at my track record. Remember, my slogan is 'Forward'. 'F-O-R-W-A-R-D'. Don't look back at all the things I promised and didn't deliver. Plus, give me some more money so I can keep up, er, start the good work. Trust me. I'm Obama. People love me!" o'idiot is living in his head...yes, maybe the hollywood crowd will kick in some cash...seems Oh Oh's millions spent on character assassination went down the drain...he's begging for more to do the same. Isn't doing the same thing over and over the definition of insanity...well, what has happened to our economy and foreign affairs is insanity...and reelecting obama would certainly be insane....or worse! The truth will out! Great youtube video! IN MITTS OWN WORDS! Every member of the voting public should watch this! Mitt Romney is everything you hate about politics! "He'll Say Whatever You Want Him to Say. . .
. . . Just for the Chance to Live in That White House!"